Rainbow, the largest European animation Studio, and Kellogg’s, leader breakfast cereal manufacturer announce their promotional partnership featuring the new animated series Regal Academy. 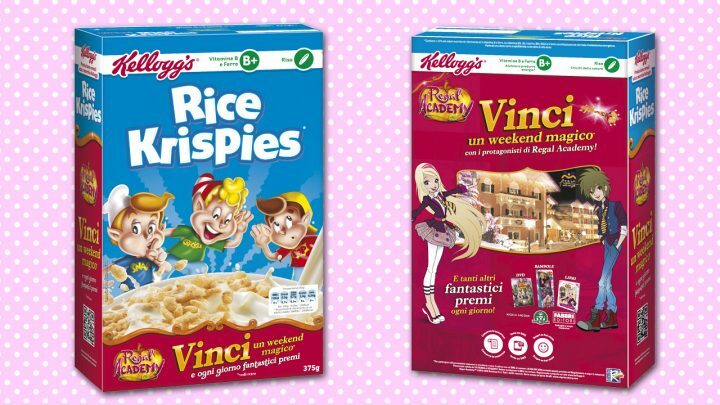 The promotion, which runs through from October 31st until February 7th (T&C on www.kellogg.it), encourages fans to enjoy a ‘Regal Breakfast’ with popular products Rice Krispies, Miel Pops and Frosties. On pack communication will be a competition in which consumers can win a Magic Regal weekend and fantastic prizes every day such as fashion dolls from Giochi Preziosi, DVDs from Koch Media and books from Fabbri Editore. Regal Academy is a fresh and funny new animated show which focuses on the adventure of shoe devotee Rose Cinderella, a normal girl whose world is turned upside down when she finds out that the fairy tale Cinderella is actually her granny! Enrolled in the wonderful Regal Academy, Rose meets with fellow students including Hawk SnowWhite, Travis Beast and Astoria Rapunzel all of whom belong to the schools founding families.